I grew up in an abusive environment, and by the time I was in high school, I had no self-esteem, and no adult figures I could trust who really cared about guiding me or keeping me safe. It’s no wonder that I ended up in a relationship with an abusive older man. 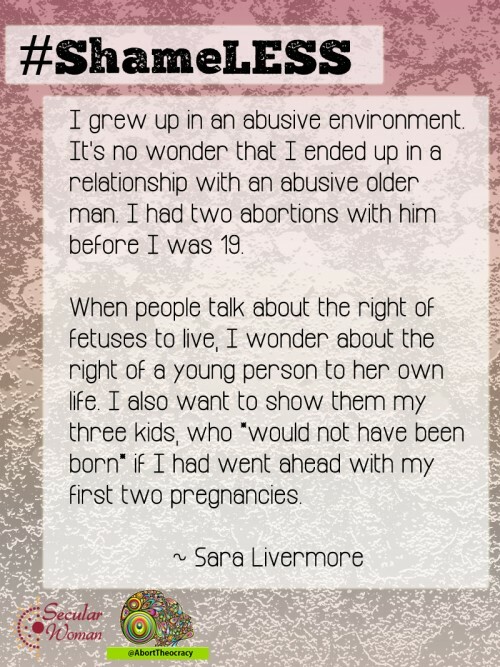 I had two abortions with him before I was 19. A few years later, I was married to another man. I would go on to college, and we would go on to have three healthy children. When people talk about the right of fetuses to live, I wonder about the right of a young person to her own life. I also want to show them my three kids, who *would not have been born* if I had went ahead with my first two pregnancies. It’s true, every decision we make affects the ones going forward, sometimes in a bad way, often in a good way. Each woman and family should have the right to make their own destiny.